The Political Equality League was founded in 1912 by a number of progressive women and men, and included among its membership many prominent leaders of the suffrage movement in Manitoba. Although principally concerned with the pursuit of women's suffrage, the diverse membership of the league led it to become involved on other issues, including direct legislation, tariff, the prohibition of the sale of alcohol, labour law reform, and the appointment of more (and female) factory inspectors. 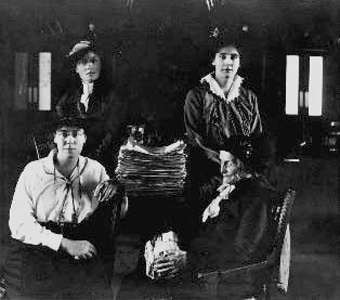 The league was founded in 1912 by a group of educated middle class activists which included Nellie McClung, Winona Flett (Mrs. F. J. Dixon), E. Cora Hind, and Francis Marion Beynon. The first president of the League was Lillian Beynon Thomas, but for most of its existence it was led by Dr. Mary Crawford. Although the membership were primarily women, the League included several men, including George Chipman and Fred Dixon. The Political Equality League shunned the violent methods of its British counterparts and relied instead on the distribution of pamphlets, petition campaigns and peaceful demonstrations. In addition , the League organized an active speakers bureau. Led by Beynon Thomas and McClung, these speakers travelled to theatres and community halls across the province bearing the messages of suffrage and maternal feminism to all who would listen. Often, the speakers had to face down hostile crowds and hecklers, and as Nellie McClung relates in her biography, “stooges” placed in the meetings by the government of Sir Rodmond Roblin, who was virulently opposed to female enfranchisement. In 1913, after presenting a petition bearing the signatures of twenty-thousand men to T. C. Norris, leader of the Liberal Party, the Liberals agreed to endorse the vote for women. Members of the Political Equality League stumped the province campaigning for the Liberals in the election of 1914, but the Conservatives were returned at the polls. In 1915, the Roblin government collapsed under the weight of its own corruption in the infamous Legislature Scandal, and the Norris Liberals came to power. In August of 1915, Norris announced that suffrage legislation would be introduced as soon as he formally received a petition signed by at least 20,000 supporters of suffrage. In December, a delegation of sixty men and women formally presented the premier with two petitions with a combined total of over 40,000 names. By January of 1916, the legislation had passed through the legislature, making Manitoba the first province to grant full suffrage rights to all women.